For more than 30 years, Vidaro has been designing and supplying garments and accessories for the high-technology disciplines of computer, aerospace and medical instrumentation, as well as the pharmaceutical, chemical, petroleum and ophthalmic fields. Permanent press, resin finished to offer “easy care” characteristics:wrinkle resistance in use and “no-iron” properties when washed. Washing does not significantly affect ESD properties of garments. Static electricity can spell trouble. In the laboratory, in manufacturing, in assembly and packaging areas, people can generate and retain static charges up to 35,000 volts — more than enough to damage or degrade nearby sensitive electronic components, devices and semiconductors. This is especially true in low-humidity areas. That is why C.C. Steven uses Vidaro Vi-Gard static dissipative fabrics for its garments. Along with other static control devices, these four Advanced Static Control fabrics provide a first-line defense against product damage. 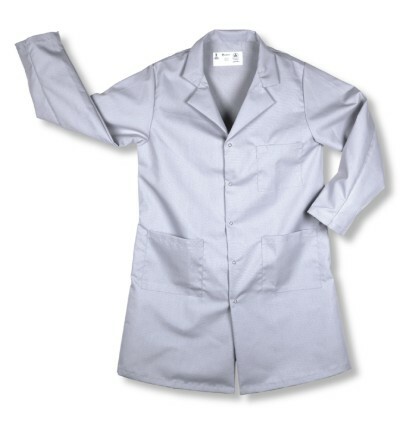 Vi-Gard garments offer durability, improved color retention and permanent static control properties. These modern, permanent-press garments require no topical treatment, so you can wear, handle, and launder them as you would ordinary clothing. 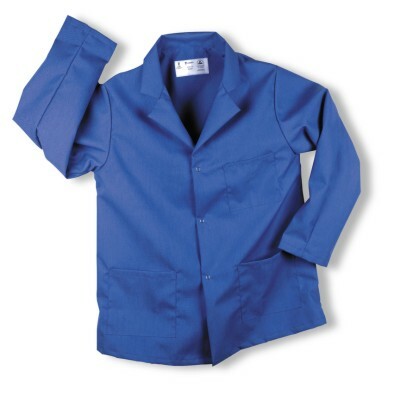 Vidaro Advanced Static Control garments are cool and comfortable, so they may be worn over normal clothing, yet they effectively reduce electrostatic charges to safe levels, eliminating the possibility of arcing from workers to sensitive electronic products. Vidaro makes clothing that works for you — for your working environment. That means we will give you exactly what you need — whether it is special sizes, features, fabrics or styles. If our stock garments are not exactly what you need, tell us. We will design in the performance features you are looking for, along with our usual top quality, exacting detail and fullness of pattern. Knee Length (38” Long) Newly designed for today’s active work environment, featuring all the Vidaro quality features you count on.